Options are the most sought after instruments for trading and probably the most misunderstood ones. You pick up, any article on options and you get thrown, complicated definitions and strategies and payoff diagrams thrown at you. The end result, people either give up the thought of trading options completely or they end up believing a few concepts which won't help them at all in their trading. What is needed is a no fluff guide, in the most basic language, which can help traders understand what these complicated but beautiful instruments of risk management are all about. So this is my attempt to strip options of the mumbo-jumbo and make it easy to digest for you, the retail trader! While future behaves like the underlying for all practical purposes (on shorter time frames), options do not. Future moves in a 1:1 fashion with underlying whereas options may not depending on several factors. We will go in greater detail and I will try to keep it as simple as possible. Expiry - Each derivative contract is only valid for a certain period of time. Unlike stocks which can continue till the underlying business is functioning. The day this contract expires is called as the expiry date. In Indian markets, we have both monthly as well as weekly option expiry (speculators often get attracted to the weekly expiry). Lot Size - Each contract has a predefined lot size. They may change at the whims of the exchange, but presently Nifty has a lot size of 75 and Banknifty lot size changed from 40 to 20 a few weeks back. So you cannot buy 5 futures for Nifty you have to buy a minimum of 75 and in multiples thereof. Margin - When you buy a future you don't have to pay the complete cost of futures up front. but you only pay a certain percentage of that cost to control the product. This is called leverage. For eg, to buy 1 lot of Nifty futures that is 75 futures you have to pay around 10-15% of the full contract value which may be upwards of INR 7,50,000 assuming Nifty is at 10000 (75 X 10000 = INR 7,50,000). so basically if you have let's say INR 75000 in your account you can buy 10 times as many nifty shares using futures instead of cash. Mark To Market (MTM) - since futures are held by paying the margin only, any profits and losses that accrue during a days trading are settled in cash at the end of the trading day. So if you bought Nifty future at 10000 and Nifty closes 100 points down at 9900, then 100 X 75, that is INR 7500 will be debited from your account at the end of the day. If you make 100 points instead INR 7500 will be credited to your account by EOD. Call Option - This option moves up if prices move up and move down if prices move down. But there is no fixed relation like futures to the underlying price. We will explore this relationship in greater detail later in the post. Put Option - This option moves down if prices move up and vice versa. Again the quantum of movement is not directly proportional to the movement of the underlying. As I said futures contract lets you buy a predetermined lot size of the underlying by paying a fraction of the cost, that is margin. for monthly contracts in India, last Thursday is the expiry for these futures contracts. If Thursday is a holiday, expiry will be preponed to Wednesday. Future behaves in a 1:1 fashion with the underlying. So if Nifty moves 100 points the future may move a more or less similar amount of points. So you can use futures as a proxy and continue holding it till the expiry as long as you are paying the margin and MTM losses if any. Due to the leverage trading futures can be extremely volatile. That is why traders, speculators get attracted to the second instrument viz Options. Falsely promoted as a get rich quick scheme. Strike Price - It is a fixed price for which the option is issued, for eg, on Nifty an option is issued for every 50 point increment at the strike price. That is if Nifty is trading at 10000 then we will have strike prices for 10000, 10050, 100100 and so on to the upside and 9950, 9900, 9850 and so on to the downside. Premium - Once the strike price is fixed the second component which is flexible the premium is decided by the market forces. How high the premium will be is decided solely by the probability of the option expiring in the money or out of the money. In The Money (ITM) - When the strike price is less than the CMP a call option is said to be in the money, so with Nifty at 10000 a 9900 strike call option will be in the money. Exactly opposite for put option, of Nifty is at 10000 a 10100 strike put option will be in the money. 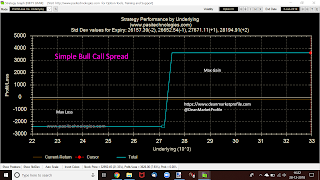 Out Of The Money (OTM) - When the strike price is greater than the CMP a call option is said to be out of the money, exactly opposite for put options. For eg, if Nifty is trading at 10000 then a 10100 call option will be out of the money. For instance, if Nifty is trading at 10000 then a 9900 strike put option will be out of the money. At The Money (ATM)- When the strike price is very close to the CMP it is called as an at the money option. Delta - It is the amount the option premium moves in relation to the movement in the underlying. Intrinsic Value - If Nifty is at 10000 and 9900 call option is trading at 150 the 10000-9900=100 is the intrinsic value. In case of put option lets say 10100 strike put option is trading at 165, then 10100-10000=100 is the intrinsic value. OTM options don't have an intrinsic value. Time Value - Whatever is left after the intrinsic value is called time value. So in above examples, the time value for a call option is 50 and put option is 65. OTM options have only time value. Time Decay (Theta) - Time value becomes zero at expiry. So if NIfty stays at 10000 till expiry, the time value of call option will become zero and premium will become 100, without doing anything. This nonlinear feature of the options makes them difficult to trade but interesting at the same time. With this information, an ITM (in the money) option has a delta which is greater than 0.5. 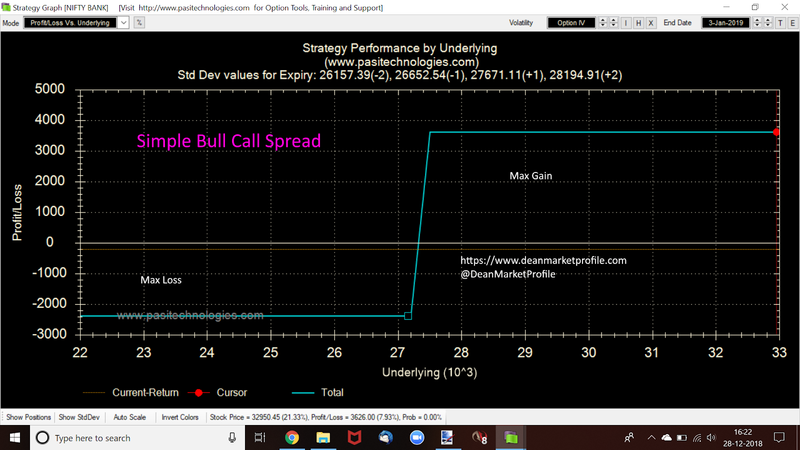 That is if Nifty moves 100 points up an ITM call option will move more than 50 points up. whereas an OTM (out of the money) call option will move less than 50 points. As the underlying keeps fluctuating, the delta for different strike prices also keeps changing. An OTM option can become ITM and vice versa. Consequently how much they respond to the changes in underlying price also change. So when you are trading options it is not only important to figure out where the underlying will go, but also how much time it will take in reaching there. These move in unison with the market, but the quantum of the move depends upon strike price and time to expiry. If you buy a call option and the markets go nowhere the time value in your option will become zero. if it is an OTM option the whole option premium will become zero. But if the underlying moves sharply up, you stand to make a lot of money. The leverage in options is insane. But leverage is a two-edged sword, it cuts on both sides. if the desired move in the underlying does not happen quickly you may lose a lot of money in a jiffy. So if you feel the underlying may move up substantially in a small period of time, you can buy call options. But keep the time value and days to expiry in mind. These move in opposition to the underlying, but the quantum of the move depends upon strike price and time to expiry. Once again if you buy a put option and markets go nowhere, you stand to lose all your time value in that option. If it is an OTM put, you will lose all the premium. But, in case of a sharp move down, you stand to make a lot of money. So you buy a put option if you feel markets may move down, but keep the time value and days to expiry in mind. Options were originally designed to help traders hedge their portfolios against non-favourable market movements. But over a period of time, the speculative interest in them has increased multifold. But you can still use them to hedge your positions or reduce the cost of your outright option positions. I will try to discuss a few strategies below but am trying very hard to keep this simple. 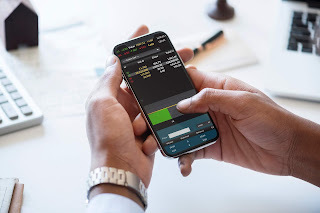 Buy put options, if the markets move higher, you will lose the premium of put options, but that loss will be made up by gains in the portfolio. But if the markets fall sharply then you stand to make a lot of money on puts, based on your hedge ratio, you can even end up making money in the downturn. You can use those proceeds to accumulate more of you stock at depressed prices. This is a frustrating situation, you buy a stock it moves up for a while and then goes into slumber. Moving sideways listlessly. But you can use options to make money in this situation too. You buy stock XYZ at INR 500. It gets stuck in a range of 535-50. You sell a 550 strike call option for 10 bucks and receive INR 10 as instant credit). If the stock stays in this range you will get INR 10 free and clear at expiry. If your stock moves higher above 550, your option will start losing money but that loss will be offset by the gains in the stock. If however, your stock falls below 500, your INR 10 credit will put your breakeven at 490, but below that, you are not protected from further downside. In this scenario, you stand to lose a maximum of 65 points, merely the difference between premiums (35-100=-65). As the prices start moving above the higher strike the 10300 short call option will start losing money, so the maximum you can gain is INR 235, you get this number by subtracting the net debt of INR 65 from the difference in stroke prices that is 300. While preparing strategies you can use a simple rule of thumb. The delta of an option (found on option chains on your broker terminal or calculated automatically in Options Oracle) gives you the probability of an option expiring in the money. So the probability of 10300 strike call option expiring ITM is about 30%, not great odds, I know... But if you can use some good technical analysis tools and analyse the markets correctly you can be pretty sure to reach your objective by the end of the series (remember time to expiry is crucial). The objective of this post is to introduce you to options, some basic definitions, simple trading strategies and invite a ton of questions. 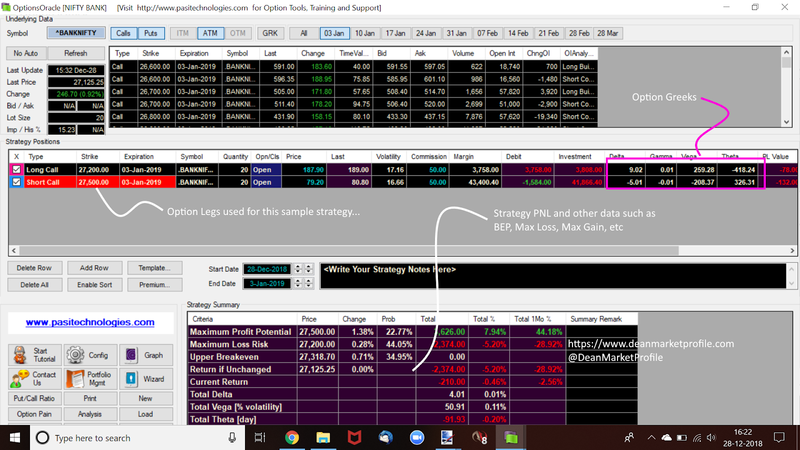 This is not going to be the last post on options from me, but you can ask me any question or doubt that springs in your mind about options and options trading strategies. So use the comments section below, I am listening! What Are Different Types Of Trading Strategies?